Elie Saab: Sets 2015 Party! Fashionistas on duty!!! If you have an issue that bombaaa off comments from women when post here on the blog is this “party”. But also, it is no less, who can control themselves in front of both luxury and wealth of details? Each day that passes, I’m more impressed with the boldness and creativity of designers, as it is, are prepared for another tide filled with fashion trends, with looks ready to jump off the screen straight to the closet? Today at luxury guess is day of fashion party, knows that a red carpet worthy dress?! In the new collection of Elie Saab, had only one, and I was with the heart throbbing to see perfection, careful and as each model is hand-picked. For this season, Elie bet on an item that usually does not use, the feathers. And the best, the dresses range from traditional to more daring, definitely has something for everyone. Elie Saab coexists with Princesses and no doubt this guarantees the look needed to create gowns worthy of them. And the fairy tale repeats this season in high fashion worthy of palaces, where should, in fact, go! I pretty much love all models, the richness of the embroidery makes the eyes of anyone shine like diamond, because the collection was really jaw-dropping. The work is all very gentle, noble fabrics and are the models that we already know, the cut and the details make all the difference. The inspiration in this parade were the times when ELIE SAAB was still a boy and saw women in fluid dresses in his hometown, Beirut. According to the stylist himself the image of his mother in a black dress with tulips was present in all creation: “I still charm by a clear vision: my mother in an evening gown, stuck in waist with tulips printed on silk. A vision that fueled my career as a designer. With each new collection that conceive, the image of my mother in that silk dress with tulips reappears infinitely. 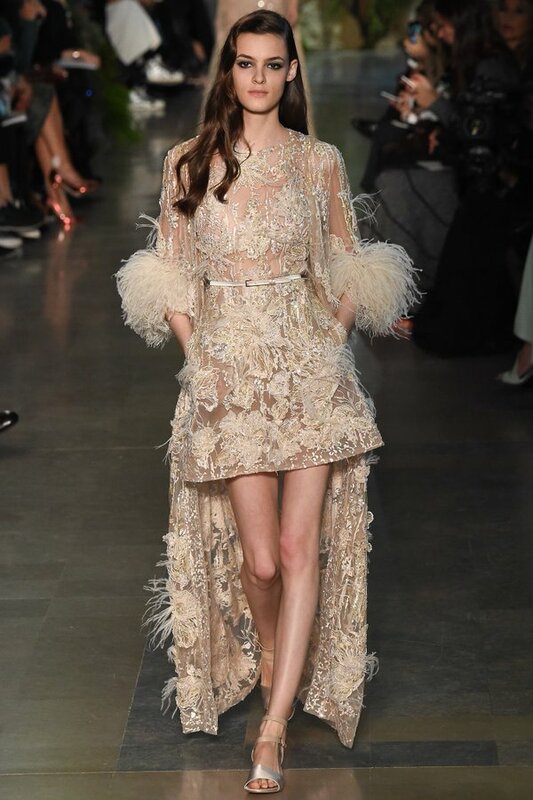 ” And the result were dressed in soft colours with ostrich feathers, embroidery in gold thread, the color palette was soft as the spring, the dresses white, off-white, candy colors, prints and of course, bluish grey to get black. But in dresses in pale tones, the stylist brought all that is most beautiful: embroidery, transparencies, waist well marked, fluid skirts and cleavage.